Internet Poll Results for "Who is the top "Self Defense"/"Street" BJJ teacher?" A poll from the popular mma.tv forums asking “Who is the top “Self Defense”/”Street” bjj teacher? 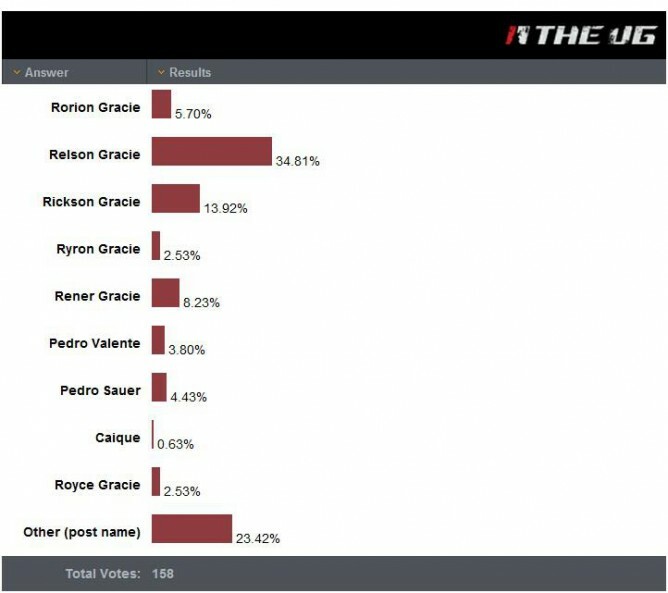 put GM Relson Gracie on the first place with 34,8%, followed by his younger brother Rickson Gracie with 13,9% and Rorio Gracie with 5,70%. Mixed Martial Arts (Vale Tudo in the old way of calling it) was born from Brazilian Jiu-Jitsu. BJJ has since then moved towards a sports aspect, what we call sport BJJ. Relson Gracie, son of Helio, shows some of the Connection Rio what the original Gracie jiu-jitsu is all about! These guys came to train BJJ in Rio, now they get a chance to train directly with one of the Gracie family at his academy in Leblon.